【 Powered Up! 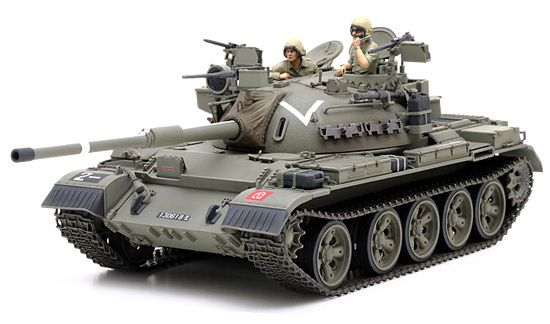 】　During the 6-Day War of 1967, the Israeli Defense Force (IDF) captured a number of T-55 tanks from the Arab countries, which they quicly modified and set to work in the IDF under the name of Tiran 5. Many of the new Tiran 5s has their 100mm gun replaced with a 105mm version and were fitted with additional weaponry: an M2 heavy machine gun on the mantlet of the main gun, and individual machine guns for the commander and loader. Storage boxes were added to the right of the turret to aid with friend/foe identification. 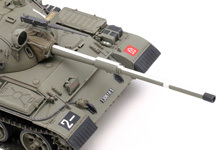 Tiran 5s saw action during the Yom Kippur War in October of 1973, and continued in front-line service until the early 1980s after which they were also distributed to forces across the world, for example the South Lebanese Army. 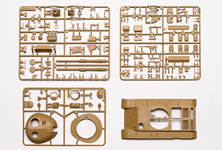 【 About the model 】　This is a 1/35 scale plastic assembly kit of the Israeli Tiran 5. ★Length: 252mm, Width: 96mm. The model captures the powerful form of the Tiran 5, complete with modified main gun, additional M2 geavy machine guns, crew machine guns and mortar mount on the left side of the vehicle. ★Realistic storage box on turret's right side,water tanks and other detailed auxiliary equipment add precision to the model. 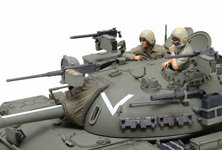 ★Comes with commander and loader torso figures (2 total), and markings to recreate the tank in its 1980 form. 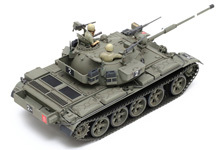 ■The low form of the tank with hemi-spherical turret is accurately reproduced. ■Original 100mm gun on the T-55 was replaced by a 105mm M68。The white mark was for differentiation and is recreated using decal. 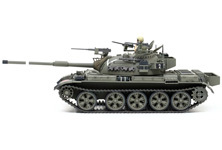 ■The tank was fitted with storage boxes on the turret and hull rear, baskets, and water tank. The engine grille has been depicted using nylon net. ■Turret captures the cast-metal texture of the original, and has mantlet-mounted M2 and left/right M1919 machine guns, in addition to the 60mm mortar mount. 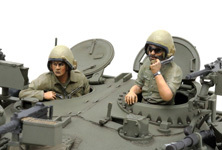 ■Commander and loader torso figures are included.